The royal family has visited more than half the world and Cuba is just the latest stop - but where is left to go? The Earldom of Forfar was created in 1661. The Queen joked how her father King George VI would become frustrated with his scrambler phone, modified by GCHQ to make his calls secret. The displays of British pageantry took place in Green Park and at the Tower of London. 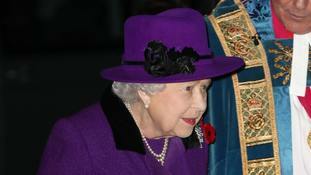 A video released by the palace showed the preparations in the Marble Hall of the Queen’s royal residence. The painting by military artist Stuart Brown was commissioned by the RAF Regiment to commemorate its 75th anniversary. The Queen watched along with the German president as flowers were laid at the grave of The Unknown Warrior, later shaking hands. In the Royal Albert Hall the Royal Family stood as thousands of audience members held aloft photos of those who took part in the conflict.